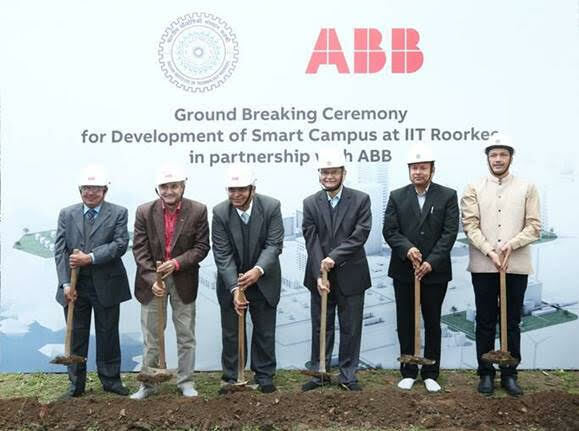 The groundbreaking ceremony of ABB microgrid with battery energy storage at the campus of Indian Institute of Technology, Roorkee (IITR), was held to commence the smart campus development project. This is part of the larger R&D collaboration outlined in an MoU (Memorandum of Understanding) between ABB and IITR signed in July, 2018. The agreement for technology collaboration also includes the creation of a Smart Grid Resource Center, joint R&D facilities and support for PhD students. The smart campus development, in addition to the microgrid, would include technology solutions like smart metering, SCADA, ring main unit (RMUs) and a backbone of wireless broadband communication platform. It aims to create an operational smart grid network integrating all sources of energy including diesel generation and renewable energy. Another objective is to create a research platform to meet the requirements of the evolving grid like bi-directional flow of electricity with localized generation and enhance environmental awareness to influence consumer behavior to maximize usage of clean energy. This will serve as one of the pilot projects for Government of India’s Smart Cities Mission. The project cost is being partially funded by ABB India under its CSR initiatives. IIT Roorkee currently has solar PV systems installed at 27 locations across the campus amounting to 1.8 MW of solar generation. When the 11 kV ABB AbilityTM PowerStore microgrid is commissioned in 2020, ABB’s advanced microgrid technology will enable the institute to increase the use of renewable energy, identify potential of demand side control, and integrate other power sources. The ABB AbilityTM Microgrid, SCADA, and smart metering will enable complete remote monitoring and maintenance, as well as visualization of overall energy requirements of the campus. IIT Roorkee has done pioneering work in recent years to build an eco-friendly campus using renewable sources. The goal is to become a self-sustaining and zero emission green campus. The advanced energy metering solutions will be used for energy accounting, billing and collection process. The metering solution will measure energy supplied by grid and diesel generators in separate registers to apply differential tariff, which will sensitize the campus residents/user community about the cost impact due to diesel consumption. ABB SCADA will offer the operator a centralized view of the grid condition and network snapshot. It will also enable power restoration swiftly from the central control, achieving minimum duration for power outage, thus improving availability. Retrofit of the ring main unit (RMU) will enable remote switching operation from the central command center and minimize people movement for manual switching. The wireless broadband communication backbone will pave the way to integrate other services on a common platform, which will be on the lines of an operating model of a smart city.